Do you know what really annoys me, more than anything else? It’s those huge books that line the shelves in the jazz guitar section of the music shop. Don’t get me wrong, it’s not that they aren’t telling the truth about what’s in these encyclopedic references. THIS IS what’s in these books. I can’t help laughing when I see books like this. It’s REALLY easy for a guitar teacher to make a book like this. The concept is simple. Just quickly write out a few scale diagrams, press the transpose button in the music notation software, do a few melodic variations and copy and paste to your heart’s content. Voila! – a hefty looking tome of impressive scale and arpeggio patterns, which should keep the punters happy (and bewildered) for months to come. Although these might be good reference books to have on your shelf for occasionally looking up some patterns, they will not help you one jot to learn to improvise and actually sound like a jazz player. Scale patterns and arpeggios, in and of themselves, are NOT jazz vocabulary. They are more like what the alphabet is to languages. Is the alphabet what we use to talk to each other when we have a conversation? Words, phrases, and ideas that make sense to your listener. Quality of material is far better than quantity when it comes to learning jazz guitar. Just because a book has a lot of pages doesn’t necessarily mean that it’s valuable or helpful for your learning. Let me know what books YOU have actually found useful when it comes to learning jazz guitar. If i can share some thoughts. What most wannabe jazz player is looking for, is Alice in wonder jazzland kind of book; A book, that teaches how to open the tiny door, to get into the jazz universe. I can play almost decent blues guitar, i can play jazz tunes, but i m not a jazz player (yet), because i have no clue how to think jazz. I can play scales of modes, i ve some licks ready. but still, it s just as if ive memorised some usefull sentences of a foreign language, that i dont speak. I listen to jazz but im not sure that if i listen to russian for decades, it will suffice to become fluent. Thanks for your thoughts Yann! I think you’ve answered your own question here in a way. There is nothing wrong with learning some ‘phrasebook sentences’ when you start learning any language, including jazz. If you internalize these phrases really well, and reach a kind of ‘critical mass’, then you will find there will be enough of a network of phrases in your mind to start improvising. I can see this in the development of the students I’m teaching in my course at the moment – each new phrase learned multiplies possibilities of all the other phrases learned. I have been playing guitar for decades, but recently began trying to learn jazz. One book that seems to be helpful is Blues to Jazz, The Essential Guide, to chords, progressions & theory by Jack Eskridge. The only fault with the book is that it should have been wire bound. I have had mine wire bound. Jazz soloing is about ideas and developing ideas. Not just moving your fingers. What a great video Sandy! Very profound thinking there. The Barry Galbraith series, particularly the “Guitar Comping” book. Full of real-life examples. you can stop at almost any point and apply the concepts directly to tunes you are working on. I don’t have his soloing book yet, but making this comment will probably send me directly to Amazon to get it. Agreed John, Barry Galbraith’s comping book is an excellent resource. who buy’s books these days? I like what are called “micro lessons”. These are short lessons that teach you a concept that you can apply quickly to your guitar practice. A good example of what I would call a micro lesson was the short lesson you gave us called “Improvisation with the Minor Pentatonic Scale”. It radically changed my way of playing this scale by showing us unique ways of playing a minor pentatonic scale i.e. right up left down, half-step approach notes and enclosures. Most people are overwhelmed by large volumes of material. By supplying a lesson only four pages long with an included backing track in Am, you set a low bar that we can clear which results in a higher more jazz sounding level of play. I hope you continue to develop more of these “micro lessons” which free you from the “caught in the box pattern” that so many of us beginners and intermediate players find themselves in. Thanks for your thoughts Doyle! I’ll keep that in mind. Steve Khan’s book of Pat Martino transcriptions from the early years gave me 1000s of ideas for licks. Bert LIgon’s book Connecting Chords With Linear Harmony is for all instruments and fantastic with lots of real examples and good explanations of adding chromatic passing tones to create lines that closely follow changes. Alan Kingstone’s book on the Barry Harris Theory Method gave me a wildly new way to look at harmony. I’ve looked at hundreds of other guitar method and jazz books and they are all the same nonsense with no logical way of actually connecting to what I’m hearing on recordings. Bert Ligon’s book is one of my favourites as well Chris. It’s the clearest and most insightful guide to improvisation I’ve ever come across. 1. Any/all of Matt Warnock’s books & lessons. Good graphics, good explanations, applicability. 2. Jazz Guitar Master Class Vol 2, by Chris Standring. For me, this simplified chord voicing and specific left-hand fingerings that facilitated chords extension melody notes. 3. The Ukulele Way (7 book series), by James Hill. I took up the use to help with jazz guitar upper string fingerings. These lesson books provide simple explanations of music theory, chord extensions, and partial-chord voicing, almost all of which are transferable to the guitar…highly recommended. The only thing that will make you a better guitar player is practice, practice, practice! “Targeted Twelve Tone Theory For Jazz” available on Amazon. Linear Expressions, from Pat Martino, is an excellent book. Agreed Djessy, that’s a great guide straight from the master himself. I forgot the title. It’ s pretty wellknown I guess. The one of Fred Sokolov. I bought IT when I was about 15. Enjoying those days to play around with all these cool looking/ sounding Chords. Some basic info on different , relevant scales. And if brought me to chordsoloing as I still play some of the arrangements I found there. I also liked the solo’s written out with backing tracking systeem on some sheet of plastic that could be played as a record. I remember these solo’s to be quiet a bit above .y skills those days. Nevertheless , I used Just small parts of these and it did give me an impression of how I could sound , well sort of .my own version of jazz. Which I actually still do to this day. Not being too interested to sound like a ‘ real’ jazz guitarist. Jazz theory though serves for me as a great source for my own creativiteit. Than again I definitely also agree with what you say about ‘ words’ and ‘phrases’ for which it’ s Essentials to learn licks. Also from the point of viewing that it’s always stupid to think you still need to invent the wheel all by yourself again. As a Dutch expression goes. Thanks for all your effort to really help others progress and coming closet to how we always wanted to sound like. My pleasure Manodj, thanks for sharing your thoughts! I’m on about pg 80 of IFR (Improvisation For Real) which seems very unique and helpful. Seems to be based on the fact that the major scale is the trunk of the tree, as we all know, but majors, no pun intended, on singing the intervals a lot, working with 1,2,3,4,5,6,7/1 as intervals, singing them, working on the neck in blocks of 1/2 tones, becoming very familiar with where the 1/2 and whole (and the rest of the intervals, I imagine) tones on adjacent strings are in relation to the index finger and pinkie finger 1/2 tones, etc. I think you are right on about ‘language immersion’, but this foundation may be an interesting/helpful addition. Keep up the good work, i.e., the emperor is naked (old fable if you haven’t heard it), that blows up traditions of stupidity and denial. Hi Greg, I think I agree with you for the most part but jazz is complex and there are lots of sincere educators that have insights into this art form that share them in print.I’m guilty of attempting to fill my musical void with these things but without that I wouldn’t have run across your insights.I’m getting more selective as to who wins a place in my library however.ted Greene,Joe diorio,berklee vol 1,2,3,,Joe pass, and others. My discrimination is informed as my education develops as to what is useful and what isn’t. All great recommendations there Frank, thanks for sharing! Don’t let little things like that get you down and upset you or else you will age and grey before your time …. 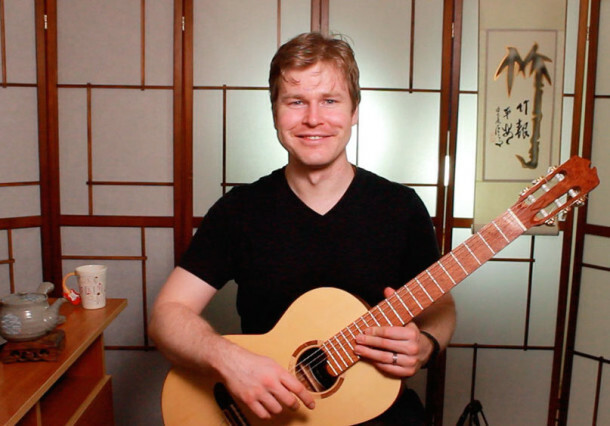 I have a HUGE library at home, but I’m focusing on chord melody these days. The Howard Morgen books are probably the best for that, overall. Also, Steve Crowell has some very helpful books as well. And yours, of course. I am very humbled that you included my book in your list of recommendations Glenn :) Thanks for contributing your thoughts! In de 70ties, the book ‘A guide to Improvisation’ (1968) by John La Porta said me most about phrasing, timing and thematic construction. It counts only 61 pages and limits itself to the essence. It was a good introduction. Today more material is available than this simple book. At that time it was very useful to me. In the 1970’s I used the 3 books from Berklee School, trying to play jazz on a classical guitar. It gave me a lot of insight, but the method of playing scales with extensions of pink and/or index finger was painful and disappointing in the low positions on a standard guitar. I think there is a big difference between a jazz guitar and a classic guitar. The playing attitude is probably more ergonomic, causing no or less torsion of the upper body. (P.s. I am just an amateur trying to play some jazz in his spare time and foremost interested by the harmony, structure and theory. Agreed, jazz guitar is a world apart from classical as it approaches the instrument in quite a different way. Bob Mintzer has published several jazz improv books that are based on jazz vocabulary within the context of various groove tunes and styles. They tend to be more melodic and connected through the changes. This is much more useful than a patterns book. Greg’s East Guide to Chord Melody is a good book for me. I can use it as one of, say, three different tools to help me along. I’m probably a way slower jazz guitar learner than average, so having something that walks me through achievable exercises is primo. Thanks for your thoughts Randy – great to hear my book has been helpful for you! Mickey Bakers complete guide to Jazz Gtr did it for me. I too have an extensive collection of door stoppers. lol. But i think the idea of one book providing all you need is a nonsense i use them particularly as a reference tool only if i find myself stuck in a phrase or section of a new composition,then they are useful. (only problem i have to find a new door stopper or just close the door.lol. Too many books!!! Not enough listening / transcribing / analysing and incorporating.. A guitar teacher told me to approach jazz the same way I approached rock and blues when I started playing.. Get the record, listen to it over and over and learn the licks and learn the song and play it in front of your family and pals.. Wish I had listened to him instead of looking for answers in books.. I guess the answers are on the great jazz recordings..
great survey! I have about a dozen books on jazz guitar. Apart from some transcription compilations (Wes, CC and Grant Green) which can be helpful in learning classic players’ styles, there are two books that really opened the door for me, especially the first one: Garrison Fewell’s “Jazz Guitar Improvisation – A Melodic Approach” and its follow-up “Jazz Guitar Improvisation – A Harmonic Approach” which then goes much deeper into harmonic relationships. Both books relate their content to real world changes (based on actual tunes) and have been and still are extremely helpful for me. First of all thanks! Your lessons, explanations, examples, transcriptions etc. are presented in a manner that people can easily understand and relate too. Unlike some academic’s whose vast wealth of knowledge often over shadows a simple easy to understand explanation, you have it going on. The enigma that is jazz is truly an exercise in endurance. No defying the need for basic and advance music theory to understand it all. For the hobbyist or average person who just likes to play for the shear pleasure of it, we often get lost in all the offerings out there. A good instructor will never be replaced. ll the books, videos and internet offering will never match that. However, your efforts on the internet are great. Keep guiding us on our journey just the way you have!